Richard Madeley on Who Do You Think You Are? Richard Madeley was born in Romford in 1956 to a British father and Canadian mother. He knows quite a lot about his father's side of the family but wants to look more into his mother's side. Richard's mother, Marie Claire was born in Canada. Her father, Hector McEwan was Scottish and her mother, Barbara Violet Bailey was Canadian. They met when Hector came to Quebec to work on a farm as a logger and they fell in love. The journey really begins as they start tracing Richard's maternal grandmother, Barbara Bailey. She was the daughter of Morris Bailey and Marie Alvenia Murdock. They find Marie, the daughter of John Murdock, in the Canadian census living in Nova Scotia. Richard heads off to Bridgetown, where they lived. Looking at a copy of John Murdock's obituary he was a well respected farmer and a friend of the Canadian Prime Minister. This would have made him quite an influential person. His own father, also John Murdock, married Harriet Hicks, another well known family. Harriet's grandfather, John Hicks, Richard's 5 x Great Grandfather, was a settler in the 1700's. Richard goes to meet a very distant cousin who is also a descendant of John Hicks. He explains that Bridgetown was originally known as Hicksville, showing how influential their family must have been. In the 1600s Nova Scotia was under French rule, but in 1713 the British took over the province and by 1750 the French had left. In the 18th century the east coast of the USA was becoming over crowded so the people went north. In 1760 John and Elizabeth Hicks and their family left New England and went north to Nova Scotia to create a new society. What a long and arduous journey that must have been. John and Elizabeth had a son called Thomas. He married Sarah Chute, who had been born in 1758 in the USA before her family moved to Nova Scotia. This was really the end of the Canadian trail and Richard's journey moves down to New England to find out more. Settlers first arrived in New England in 1620. Richard heads to Boston, which was founded in 1630 and named after the town Boston in Lincolnshire. Sarah Chute was the daughter of Ezekiel Chute and Ann Woodward and they arrived in New England in the mid 17th century. At the Massachusetts archive Richard is shown a petition that Ann Woodward signed. It was petitioning for the release of a midwife called Alice Tilley who had been convicted of crimes as a midwife. In total 217 women stood up against the governors and secured her release. This is quite an amazing achievement really considering that women had very few rights back then. Ezekiel was actually born in the UK in Podington in Bedfordshire in 1624. Richard learns that he was a sergeant in King Philip's War so he travels to Rhode Island where the battle took place. This was a war that took place between Native Americans and the English colonists. It was a very bloody war. Richard's ancestor was 51 when he went away to fight and was away from home for 2 months, which must have been hard for him and his family. By 1676 the Indians had been forcibly re-settled and the English colonists had total control. Richard meets someone who is a direct descendant of one of the Native Americans that his 8 x great Grandfather would have fought against. This is a meeting that makes Richard feel very guilty about the actions of his ancestor. Ezekiel was married to Ann Beamsley and Richard then concentrates on her to see how far back his American line goes. Ann was born in Boston in 1632, the daughter of William Beamsley. Amazingly Richard was shown the original record of her birth, which was one of the earliest recorded in Boston. Her family were some of the first settlers in the USA and would have possibly travelled over with John Winthrop and the other puritans. However, Richard does learn that her family weren't puritans as they were members of a local church in Boston. And there Richard's remarkable journey ends. He ended by saying that he feels re-defined knowing where he comes from and what his ancestors did. His ancestors came with hope and optimism and fear and they succeeded in what they did. Richard hopes that he has that within himself too. Whilst some of the records he saw would be hard to find, you can still use Genes Reunited to search for your own ancestors by searching the names added to trees and contacting the members who added them. 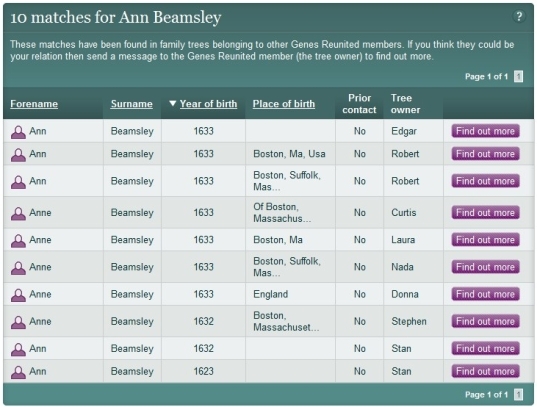 We've had a look for Richard's ancestor Ann Beamsley and she appears in a few trees on the site. Who knows what you could uncover and share when you contact other members?